Tokyo Metro (Head Office in: Taito Ward, Tokyo; President: Akiyoshi Yamamura) will implement ticket vending machines that can be used with ease and in comfort by passengers who are unfamiliar with the use of Tokyo Metro subway lines, including foreign travelers to Japan whose numbers continue to grow in recent years. Starting with the Tuesday, March 27, 2018 implementation of these ticket vending machines at Ueno Station on the Ginza Line, which just underwent renovation last December, the machines will be successively implemented at Asakusa Station and other stations with considerable traveler traffic. Tokyo Metro has been engaged in this endeavor, which has involved machine development, execution and operation jointly conducted with the Bureau of Transportation under the Tokyo Metropolitan Government, since 2016. Two new functions have been added to the ticket vending machines, namely "station name search using pinyin" and "amount buttons on the standby screen," upon their test operation. 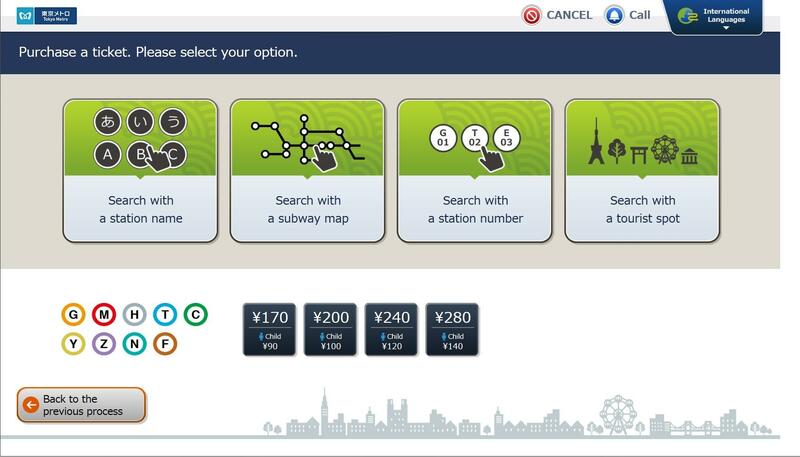 Additionally, the ticket vending machines for travelers to be installed at Ueno Station, Asakusa Station and Ginza Station will be outfitted with a sizable 32" display, which is larger than a conventional configuration, so that the screen can be easily seen when families and groups use the machines. Going forward, Tokyo Metro will continue endeavoring to ensure that both Japanese and foreign passengers can use its subway lines with ease and in comfort to fully enjoy all that the city Tokyo has to offer.